Acupuncture is a method of encouraging the body to promote natural healing and improve function. 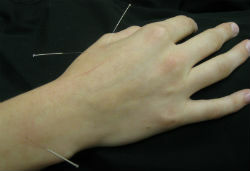 This is done by inserting needles and at very precise acupuncture points. Inserting a needle into local tissue helps to increase blood supply to that area. In turn, healing is facilitated. Needling may also help to break up trigger points and encourage tissue repair. Dr. Clemenson has a fellow certification in acupuncture with the International Academy of Medical Acupuncture. “I just found that it was beneficial to have an additional therapy to offer my patients that was a good complement to chiropractic.” Typically, chiropractic techniques are tried first, however, if those techniques aren’t bringing the desired results, acupuncture can be added as an additional therapy.